I would like to briefly introduce myself. I have established this site to reach people who are interested in children's yoga. I have been concerned with children's yoga since 1986 and gave my first courses in early 1987. I have now taught well over 2,000 children in yoga courses and workshops. Since 1989 I have been offering courses in children's yoga in Germany and Switzerland, also in Sri Lanka in 1999, and since 2006 in Austria for people who want to practise yoga with children. Participants are yoga teachers, educators, physiotherapists and psychotherapists, teachers and other people who are involved with children. In early 2002, I established this website "kinderyoga.de" as an information site and launched it on the web. I see it as a platform for all those who are involved with children - whether professionally or privately as parents, grandparents, godparents, etc. I offer courses in children's yoga on a regular basis, either as intensive courses or as weekend courses. Current dates and venues can be found here www.kinderyoga-akademie.de. 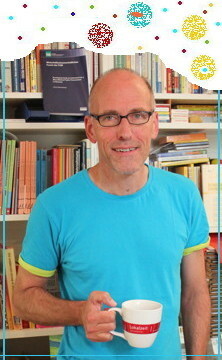 In autumn 2005, my book "Yoga für Kinder" (Yoga for Children) was published by Gräfe und Unzer Verlag (GU). For more information on this see Books. Do you want to know what I do apart from children's yoga? You can find out about this under bannenberg.de. I am always pleased to receive your feedback on the website www.kinderyoga.de.